Many UK dwellers have bought Xiaomi products before. I’ve sometimes considered buying one of its smartphones online, and own one of its dash-cams. However, the brand is now officially coming to the UK and will hook up with tech distributors like Amazon, Three, CPW and John Lewis – as well as opening a flagship Mi Store in Westfield London. Xiaomi entered France and Italy back in May and it has been in Spain for nearly a year – where it is already established as the third most popular smartphone brand. Globally Xiaomi is ranked 4th for smartphones, and with its European expansion plans gaining traction we can see it has plans and ambitions. 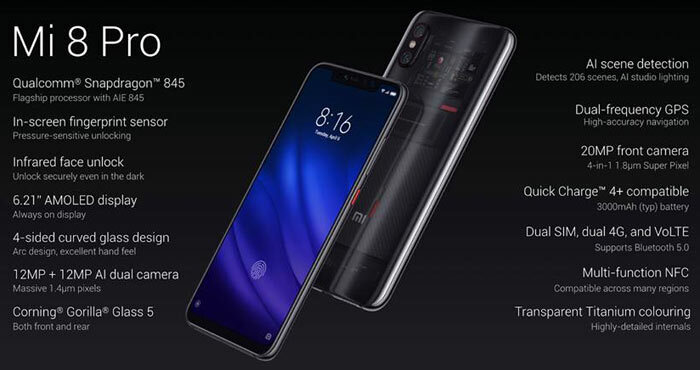 The firm is highlighting that its latest and greatest smartphone, the 6.21-inch AMOLED screen Mi 8 Pro with SD845 processor, will be making its global debut outside of China at the London Launch event (£499). Other popular products fleshing out the store will be various smartphones like the Redmi 6A, the Xiaomi Band 3, and the Mi Electric Scooter. The electric scooter sounds interesting with its £399 price, 30km range, LED headlight and regenerative braking. Other products stocked from the outset will be household tech as diverse as toothbrushes, smart kettles, STBs, Bluetooth speakers, and headphones. Looking though the blog post and London Mi Store page gives no indication of PC laptop availability. The firm has launched some nice looking and keenly prices laptops, and even a gaming laptop, back in China so I would hope they will feature over here in coming weeks / months. If you are interested in checking out the Xiaomi products available here in the UK head on over to the link above, and you will see there is an introductory £20 off voucher (minimum spend £99, from now until 11th Nov) to celebrate the store’s Grand Opening. Yawn….. will continue to import mine from China or grey importers due to better selection & price differential, which isn't solely due to VAT before anyone asks. Most people aren't going to spend the time and effort to find a phone to import from overseas. Calculate the Customs Duty. Or be happy to pay high postage fees for returns. They are willing to pay a little extra for the convenience and that is where a UK market presence makes sense. I've been more put off by the potential hassle of warranty returns. This does make me more likely to buy one of their phones. Edit: Blimey, that Pocophone's good value. £349 for an SD845 with 6Gb RAM and 128Gb onboard? Only £20 markup for the extra 64Gb? The scooter is technically illegal to ride anywhere except on private land. It's not legal to ride it on the footway and is classed as not roadworthy for use on the carriageway.